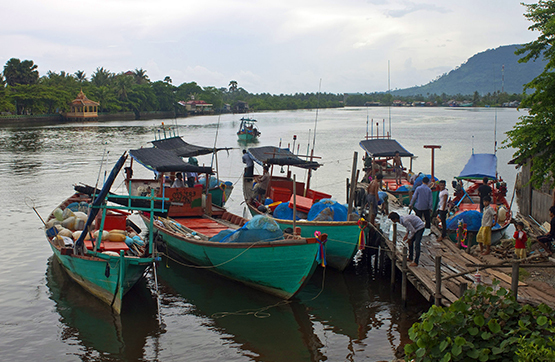 Guests embark on a day of exploration as they head from Sihanoukville Port to Ream National Park. On arrival we take a boat tour and cruise along the mangrove lined river to a tower that overlooks lush green countryside, spanning more than 1500 hectares along Prek Tuk Sap River. 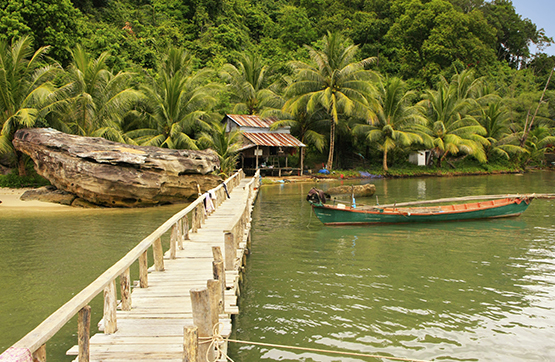 The boat will stop at Thmor Thom Fishing village where each guest can explore the region on an enjoyable 60 minute trek to Koh Sampouch Beach. A delicious lunch is then served at the beach before driving back to Sihanoukville Town. In Sihanoukville Town we stop to allow time for photos at a vibrant local market. It’s a great chance to see local Khmer life in full swing. Prior to returning to the ship we visit the most prominent religious site in the area Intra Ngean Pagoda, where guests receive a blessing by the monks who also perform a traditional ceremony by sprinkling water and flowers over the group while chanting. Guests disembark the ship and depart on a scenic two and a half hour drive to Kampot where we stop visit the local pepper plantations this area is famed for. The landscape around Kampot is mainly exotic palm trees and rice fields which we explore on arrival. Upon arrival in Kampot our first stop is at a local market where we wander among numerous colorful stalls and can purchase a traditional Krama, the colorful Cambodian headscarf commonly worn by Khmer people. A walk along the riverfront introduces views of classical French Colonial architecture that is most resplendent in Kampot Town. Lunch is then served in a traditional Cambodian restaurant where guests can sample an array of local delights before leaving to visit Ropang Ropov, a sleepy fishing village where villagers are seen going about their daily business.